Since 1996 new homes are required under Article 550.16(A)(2) of the National Electrical Code (NEC) 2008, the dryer outlet shall be installed with a 4 wire electrical supply so that the neutral and ground wires are separated and not carried on the same wire. Electric dryers require 220 volts and the wire used to supply the dryer receptacle should be 10 gauge wire rated to carry 30 amps. 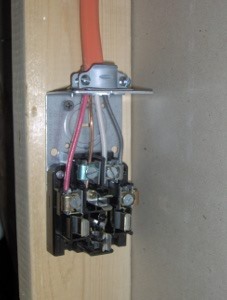 10-3 wire will have one red wire(hot), one black wire(hot), one white wire(neutral), and a bare copper ground wire. Important!!! Make sure the electric is turned off to the dryer receptacle. Prepare the wires for installation, strip the plastic off the ends of the wire down approximately 3/8" from the end of the wires. Connect the bare copper ground wire to the middle terminal with the green screw. Connect the white(neutral) wire to the other middle terminal. The two outer terminals are the hot terminals, it does not matter which side specifically the red and black wires gets connected to. Tighten the grommet at the bottom of the receptacle box to secure the wire and install the cover.